Police are investigating two attempted ram-raids of ATMs in Biggleswade and Gamlingay in the early hours of Saturday. 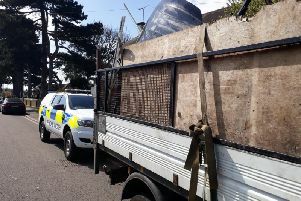 One machine was pulled from the wall on Mill Street in Gamlingay, at about 1:45 on Saturday morning using a stolen agricultural vehicle but were interrupted by police and fled empty handed. Then shortly before 4am, a vehicle believed to be stolen was used to damage an outer wall of Morrisons supermarket in Market Square. Police attended and recovered the vehicle, which was left at the scene. The offenders made off without the cash machine. A scene guard is currently in place and enquiries are ongoing. Anyone with information is asked to call the police non-emergency number 101. Alternatively, call Crimestoppers anonymously on 0800 555 111. • Ensure all windows and doors are locked that are not in use and all secured at the end of the working day. • Try to block any main access points from the road. For example if your shop is located on a high street, try to ensure a vehicle is parked outside. • If there is a car park for the location, could this be blocked off in anyway after the hours of business? • If you do have an ATM machine ensure it is highly secured and in a position that is not easy to access. Ensure it is not near to any access points and make sure it is covered by CCTV. • Do you have anti-ram bollards installed? Although there may be cost implications initially this could be a lot less than the repair and recovery cost. • Ensure that your alarm is in full working order. • Ensure that your CCTV system is in full working order and that the camera lenses are not obscured by cobwebs or overgrown greenery. • Make it obvious that CCTV is monitoring by displaying bright signage both internally and externally. • Speak to any neighbouring properties; ensure they call the police if anything suspicious is seen.